Yesterday morning I recieved a phone call from the Cruising Division at Middle Harbour Yacht Club, their guest speaker for last nights meeting had dropped out. Could I fill in and do a talk? Melissa spent most of the morning putting together a modified version of the Power Point presentation that she and Ben did for the Sydney International Boat show a couple of weeks ago [well it seems like that]. The cruising division at the club is quite active and they usually have around 40 members turn up, cook a BBQ and then have their meeting followed by a guest, in this case me. As the clubs principal race officer, I know a few of them , but it was great to meet up with some of the rest of the division. They even have one fellow who keeps up to track with any new developments in the news, magazines or on the net. In this case he mentioned the rash of European built boats coming in with sub standard skin fittings. well, did I come on a good night! The presentation started on Liros ropes, the care, upkeep, choices and a host of other issues when owning a yacht. I had a few rope whip samples which were passed around. Some of those there still had wire halyards! I then opened up the bin I had of Forespar including a few of the Marelon skin fittings. This raised an eye with many there as it was surprising how many didn’t look after or regularly maintain their seacocks and valves, I think a few may when they next go aboard. I spoke for over 1/2hr and then with questions and there were plenty, I was talking for over an hour, followed by those who came up afterwards. I think I managed to open a few eyes with the DeckHardware product range, many had picked up one of our discs at the show but were still to have a look. After last night a few will. Come this Saturday at the club, I’m sure there will be a few asking some more questions. Hopefully I can help them out. I haven’t written an update for some time, although I did try whilst away on this trip, however internet connections didn’t help. Prior to this trip we had the Sydney International Boatshow at Darling Harbour in early August. DeckHardware again had a large presence including a new Heron dinghy showing the latest Allen fittings and Liros ropes. We had a great help from our regulars including Ben, who flew in from Tasmania, Goughy and Shane our sailmakers and Georgia our number one seller at the show. We had plenty of visitors and the show was one of the best we have had in quite some time, hopefuly the economy is on the improve. Following the show, I drove up to Far North Queensland for my annual sales trip in that area. I ring up the customers in the area and let them know I’m coming, some take the advantage and order, others buy from the van. 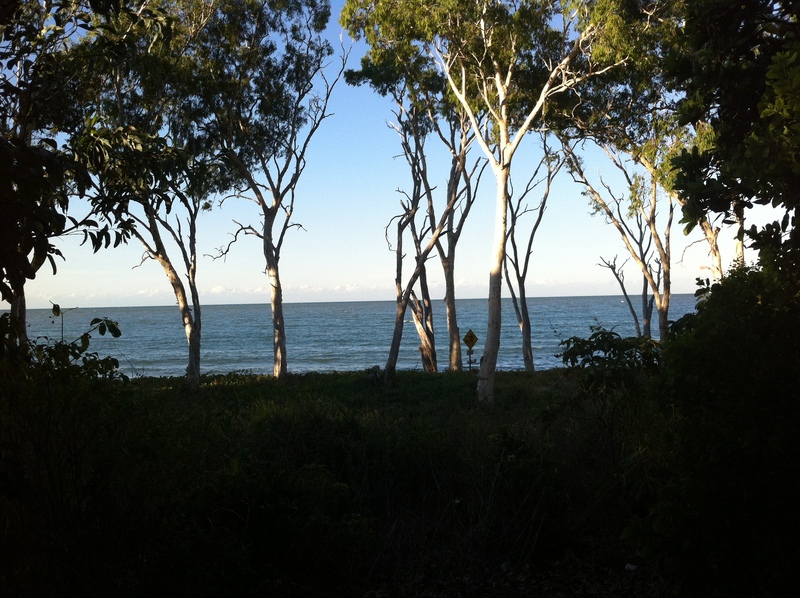 The photo above shows where I stay halfway between Port Douglas and Cairns, not a bad view to wake up to. I saw some 77 customers both old and new over a 10 day period. Some I was in and out of, others I was there for several hours. I drive up through the ‘guts’ of Australia, literally a straight line from Sydney going north, then work my way back south. The last stop was Bundaberg where I have to make the short stop to a certain Rum distillery, unfortunately they didn’t have any high ball glasses in stock. One of the great things about this trip, is finding all those boats from long ago that have semingly disappeared. The photo above is of Warri, possibly the first of Bob Millers [Ben Lexcen] One Tonners in Bowen. 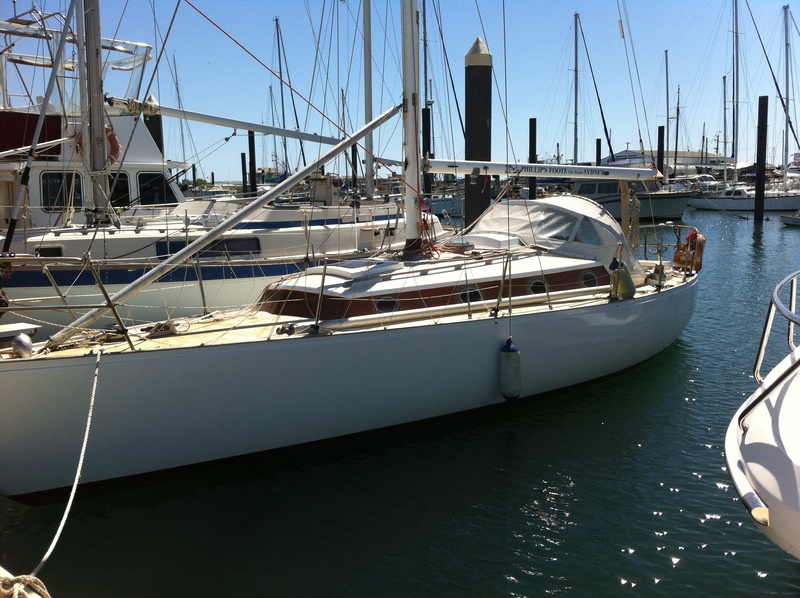 Also in Bowen was Deception a Peterson 37 that I sailed against in the early 80s when she was known as Simon Greens Thirlemere. One of the sorriest sights was that of The Card. A former Whitbread Round the World racer, she came to a sorry end in a Cyclone. Washed ashore and ground against the rocks, nearly half the hull has disappeared. Amazingly she wasn’t stripped. 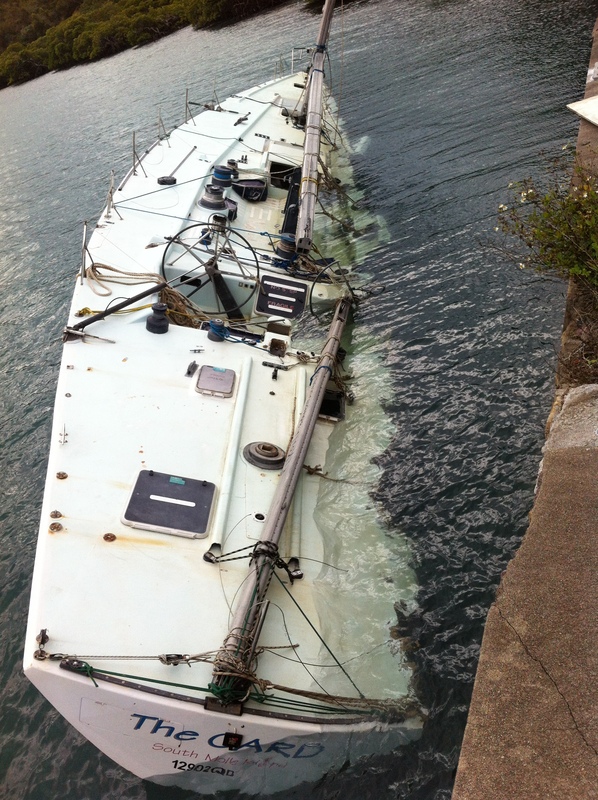 She’s left in this state at Shute Harbour, near Airlie Beach. For the first time, I suffered a flat tyre, luckily whilst in Townsville CBD. I also got a stone chip, right in the bottom right corner of the windscreen. Yep, P plate driver overtaking in a 80k roadworks zone just north of Bowen. All the traffic was doing 80, I can asure you he was doing over the ton! Having seen nearly 80 businesses, chandleries, boat builder, riggers and 6461kms later, home. THEN, it’s straight back in to the summer season at Middle Harbour Yacht Club and another season as Principal Race Officer. This season is looking forward to being another busy one with 200 odd competitors at the NSW Youth Titles at Belmont 16s in October. Then there will be the the Rolex Sydney Hobart race on Boxing Day and the Adams10m titles at MHYC in January. The last major event will be the Sydney Harbour Regatta in March. Knowing life, it’ll come around pretty quick!